France is rejoining the Eurail’s Select Pass, making it a four-country Eurailpass © 2014 Karen Rubin/news-photos-features.com. Traveling in France with a Eurail Select Pass will be possible again from April 1, 2014. After a one year absence of France in the Select Pass offer, SNCF, the French rail operator, today announced their decision to rejoin Eurail’s revamped Select Pass. “We are happy to welcome SNCF back to the Eurail Select Pass. France is a top tourist destination of strategic importance to the European rail network and, as such, of great significance to our Eurail Pass product. With France rejoining the Select Pass prior to the start of the high season, I have no doubt the Eurail Pass Portfolio will offer our overseas customers once again the most comprehensive way to explore Europe by rail,” says Silvia Görlach, Eurail Group’s Sales & Marketing Manager. The Eurail Select Pass in its current format will cease to exist from April 1, 2014. Instead of having the option to choose any three, four or five countries, the Eurail Select Pass re-launches as a Four-Country Pass only. Customers can tailor-make their own pass by selecting four out of 26 participating countries in which to travel, provided that they are directly connected by a participating Eurail railway or shipping line. Three, Four and Five Country Select Passes in its current format will still be available for sale until March 31, 2014, not including France. Starting on April 1st, only Four Country Select Passes can be purchased, with France as one of the 26 Eurail countries to choose from. Eurail Group offers four types of Eurail Passes as part of its product portfolio to those residing outside of Europe: the Eurail Global Pass valid in 24 member countries, the Eurail Select Pass, the Eurail Regional Pass and the Eurail One Country Pass. The Eurail Global Pass continues to be the most popular pass in the Eurail portfolio. It covers nearly the entire European continent and gives travelers the largest variety of countries to choose from. Travelers can still take advantage of the special Eurail “Early Bird” promotion which offers non-European residents free travel days on Eurail Global Passes purchased by March 31, 2014. Eurail Passes are available from a worldwide network of Authorized General Sales Agents. Visit www.eurailgroup.org/eurail-vendors. 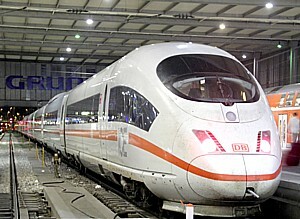 Eurail Group G.I.E., the organization dedicated to the marketing and management of the Eurail Passes, is wholly owned by over 30 participating railways and shipping companies. In addition, Eurail Group has many benefit partners, including hotels, transport companies and museums, which offer their services either at a reduced rate or free of charge to rail pass holders.